For those looking to get a quick, full glimpse of the Okinawan culture, the Gyokusendo Kingdom Village is the perfect place to get your feet wet. Here, you'll be able to learn and experience as much of Okinawa's culture as you can possibly cram into one day. Located at Maekawa Tamagusuku Village near the southernmost part of Okinawa, the park is worth the drive no matter where you embark from, and if you're coming from on-base, MCCS Tours Plus offers two tours to the park every week. The main feature of Gyokusendo Kingdom Village is Gyokusendo Cave, Japan's second longest cave, which is claimed to have the greatest stalactites and stalagmites in all of Asia. 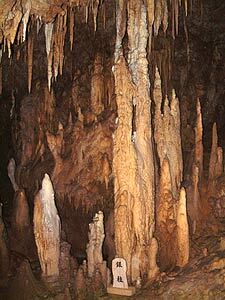 Gyokusendo Cave is quite a spectacle, for certain! In March 1967, a team from Ehime University made a thorough survey of the cave and found it to be 5 kilometers in length. A few years back, tourists could only hike a little bit of the cave, but now visitors are able to explore about a kilometer of it on a developed and dimly lit path. From now until September 1, Gyokusendo Kingdom Village is having a special cave spelunking event geared for elementary, middle school, and high school students. During Doki Doki Makuratanken ("Scary Adventure"), all of the lights in the cave are turned off and students are invited to explore the cave in the dark using flashlights. Admission to the event is ¥3000 for high school students and adults and ¥2000 for elementary and middle school students. To attend the daily event, make reservations the day before by calling 098-949-7421. Doki Doki Makuratanken's fee also includes a full pass to the park, so come early and take full advantage of the park. The event kicks off at 4:30 p.m. with an eisa show, and then everybody is expected to meet in front of the Ryukyuan trading ship at 6 p.m. At 6:10, the cave exploration begins, lasting until 7 p.m. The scary adventure also includes an outdoor barbeque from 7 p.m. to 8:30 p.m. The park is also hosting a large spider and snake exhibit from now until September 1. Get your picture taken with a golden python and then check out a few of the park's monster snakes. "Two of them are so big they can eat a whole large mouse in five hours," boasts a park employee, grimacing. Aside from these two summer specials, the park has many opportunities for visitors to experience the Ryukyuan culture. While visiting Gyokusendo Village, stop by the tropical orchards, which has over 450 tropical trees bearing over 100 kinds of fruits. Then, watch potters shape clay on their wheels as masters create beautiful Ryukyu glass. 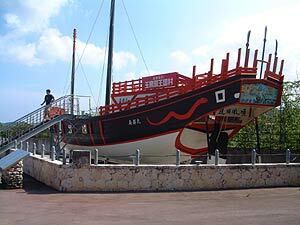 The park also has a traditional crafts village, Ryukyuan Trade Vessel exhibit, and a brewery which makes some of the best habu sake and beer that can be found anywhere! While visiting the park, you can also watch live eisa dances at the Traditional Performance Plaza. 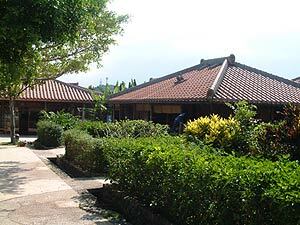 The Gyokusendo Kingdom Village has been designated as a facility of the Okinawa Prefectural Museum and is one of the most visit worthy places on Okinawa for getting a good glimpse of all that makes Okinawa what it is. The park is open year round and opens for business at 9 a.m. and closes at 5:30 p.m. unless you are part of the special summer events. Admission to the Kingdom Village is ¥600 for adults and ¥300 for kids. A Gyokusendo Kingdom Village pass allowing access to the Kingdom Village and the cave costs ¥1200 for adults and ¥600 for kids. Admission to the Habu Park costs ¥600 for adults and ¥300 for kids, and a full park pass costs ¥1600 for adults and ¥800 for kids. For more information, call 098-949-7421. Driving to the Kingdom Village is easy. Take the expressway to the southernmost exit and turn left. A short distance ahead, you'll see a sign for the park.